Picture this: it’s Sunday night, after a weekend spent hanging with friends, chilling with a good book, and whipping up some next-level brunch. But, after two days of non-work bliss, all that stress you left at the office comes back with a vengeance, making getting a good night’s rest on a Sunday one of the weekend’s most difficult tasks. 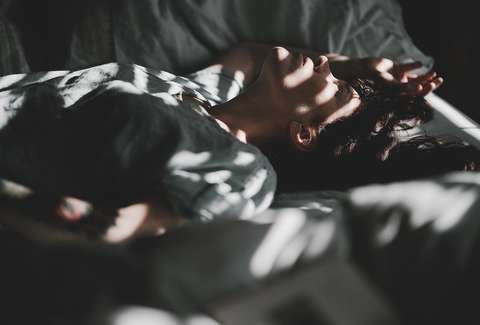 To help you conquer the Sunday Scaries, we hit up Dr. Rebecca Robbins, a postdoctoral fellow in the Department of Population Health at NYU Langone Health, and Stacey Bell, a yoga instructor at Powerflow School of Yoga, for their best tips to calm your mind and get some serious shut eye. While weekends may be for chilling, one of the best things you can do for a good night’s sleep is maintain a regular routine. Most of us have no problem keeping the same bedtime and morning schedule Monday through Friday. But when it comes to weekends, and the late night parties, dinners, and Netflix binge sessions that come with them, it gets a bit more complicated. Dr. Robbins calls this “social jet lag” because pushing your normal sleep and wake times back (even by just a few hours) can feel nearly as exhausting as flying into London from NYC. That’s because your body’s circadian rhythms are set by the schedule you create (and sunlight, but more on that in a bit) and determine when you’ll actually get sleepy. More so than nixing staying out late though, she recommends waking up at your normal time on Sunday mornings -- even if you’re dog tired. Doing so will ensure you’re flat out exhausted come bedtime, a good thing if you’re trying to sleep soundly before work on Monday morning. If you can’t make it through the day, a 90-minute siesta in the afternoon will get you through a whole REM cycle and be better than sleeping in until 11am, she says. There’s a reason you always fall asleep so easily at a hotel, and easy access to a mini bar has nothing to do with it. The rooms are clutter free, normally decorated in neutral tones, and have big cozy beds. That’s exactly the way your space at home should feel if you’re looking to get a good night’s sleep. Robbins says those neutral colors keep your mind at ease, and while we can’t always avoid cluttering up the bedroom, keeping the room as dark as possible (like even covering up a small power light on your fan) can make for a better night’s sleep. One thing hotel rooms have that shouldn’t be anywhere near your sleep space: A TV. Falling asleep to a TV makes for restlessness thanks to the light the screen emits. How old is your mattress? If your answer was something like, “I have no idea, I got it for free from my old roommate!” chances are you need a new one. The National Sleep Foundation says a mattress should be replaced (on average) about every eight years, and you should be prepared to spend about $1,000 on a replacement -- much less and you’ll be more likely to replace it before those eight years are up, Robbins says. But there’s more than just a dollar amount to consider here -- your sleep position, weight, and how light (or heavy) of a sleeper you are can affect what kind of mattress you should be buying for optimal sleep. Plenty has been written about how your phone should be kept far away from you while you sleep, thanks to that pesky “blue light” it emits. That blue light is an environmental cue that it’s time to wake up (a.k.a. a “zeitgeber”) and is similar to the morning light you’d see if you woke up in a hotel room overlooking the beach. In other words, checking your phone at 3am is going to send your brain some seriously mixed signals. But Robbins knows that keeping your phone far away while you sleep isn’t really feasible, and can cause even more anxiety for some. Instead, she suggests looking into apps that dim the blue light feature on your phone a few hours before bed and keeping it in airplane mode while you sleep. That way, if you wake up in the middle of the night, you have to make a conscious decision to turn back on your wifi and cell service to get all those notifications. There’s a reason parents set a bedtime routine for their kids, and it’s not just so they can get them to sleep in time for the next episode of Westworld. (Although that’s true, too.) 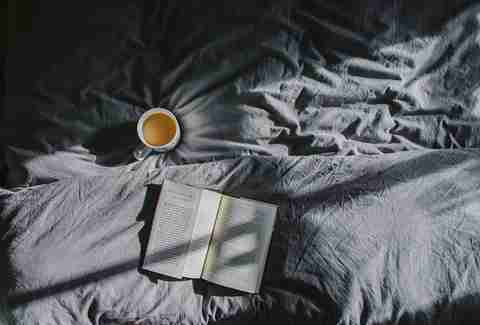 Robbins says establishing a set routine of “calming” tasks before bed, like reading for a half hour, setting the thermostat down low, taking a warm bath or shower, or even a simple skin care regimen can help tell your brain “it’s time to get to bed” and start to calm your mind. Few things are more comforting on a crisp fall Sunday than having a cup of coffee in the middle of the afternoon. But, thanks to the fact that caffeine has a half life of about six hours, that 4pm intake is going to still be hanging around come 10pm. Instead, Robbins suggests switching over to green tea, especially in the afternoon. It still has caffeine, but it also contains L-theanine, a compound that can improve your relaxation and calmness -- and that can help set the mood for a chill (read: sleepy) evening. It’s a no brainer that exercise can lead to a more sound sleep, thanks to its ability to combat insomnia-related ailments like anxiety and depression. But Robbins takes it a step further and recommends really sweating it out. Rather than using Sunday as a rest day, fitting in a vigorous workout will increase your body temp, and, once your workout is finished, you’ll start to cool down -- and that cooling can trigger your body to feel sleepy. She also says that you don’t have to worry about working out too close to bedtime either, so train extra hard for your marathon, push yourself to new limits at the gym, or sweat it out in a vigorous hot yoga class. Your endorphins will be pumping and you’ll be nice and tired (albeit, a little sore) by bedtime. Speaking of yoga, in yoga classes, instructors like Stacey Bell encourage something called “Ujjayi” breath to ease your mind. To do this, you gently constrict the back of your throat while you breathe to make an audible “ocean” sound. 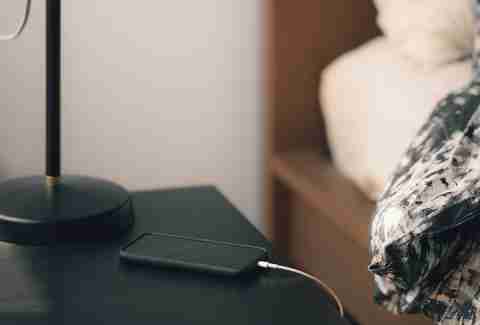 The sound helps your mind focus on your breath, rather than pesky thoughts lurking around when you’re trying to sleep. Five to 10 deep yogic breaths, where you fill the three chambers of your torso (belly, rib cage, and chest) with air while lying down, then exhale in a slow, controlled way, can help, too. 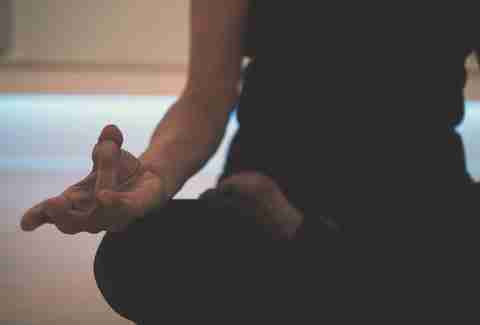 There’s a reason why yogis are notoriously zen, and it’s not just because of their breathing. Simple poses that involve a slight inversion (where your head is below your heart) can help quiet down the mind, thanks to the new perspective, Bell says. A simple standing forward fold, with your feet 6 to 12 inches apart and hands placed on the ground outside your feet, will stretch out your back and stimulate the side of the nervous system that controls digestion and relaxation. To do something similar sitting down, and get a good hip stretch, try the fire log pose. Here, place the right leg over the left so that the top ankle is over the bottom knee and the top knee is over the bottom ankle. Then fold forward, hold the position, and breathe. According to Bell, a lot of tension is held in our hips, and releasing it before bed can prepare the body and mind to relax at night. If you’re already in bed, putting your feet and legs up against the wall for 5 to 15 seconds while you concentrate on relaxing each part of your body will get you ready for sleep. There’s nothing more frustrating than waking up at 3am on Sunday night and not being able to fall back to sleep. 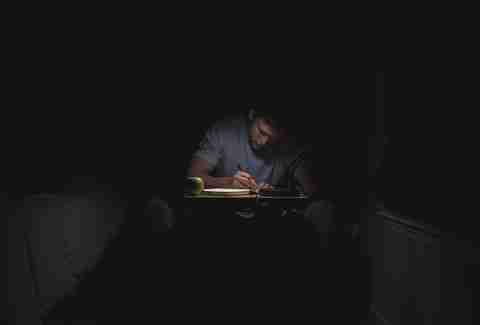 If you can’t seem to quiet your mind, taking the time to jot those worries down for a few minutes can help you feel more prepared for the next day, Dr. Robbins says. Bell also recommends journaling, but suggests doing it before bed, and writing down anything that triggered you during the day to resolve and release it before climbing under the covers. Taking a moment to reflect on some things you are thankful for that day can also help get you in the mindset to get to bed and tackle the week ahead. “Nothing like a clear conscience to make sleep more dreamy,” Bell says.